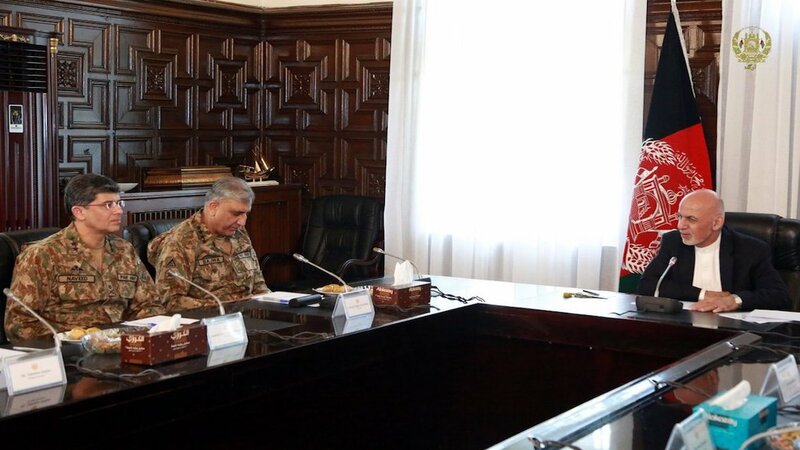 KABUL -- Afghan President Ashraf Ghani Tuesday (June 12) met with Pakistani Chief of Army Staff Gen. Qamar Javed Bajwa in Kabul to discuss their countries' security, Ghani's office said in a statement. The two sides discussed the implementation of the Afghanistan-Pakistan Action Plan for Peace, the fight against terrorism and violence and the Afghan-led peace process, said the statement. In February, Bajwa visited Kabul to meet with top regional military chiefs as well as US CENTCOM commander Gen. Joseph Votel. Pakistani Foreign Office spokesman Dr. Muhammad Faisal in a statement Saturday (June 9) reiterated Pakistan's support for "recent peace initiatives in Afghanistan", referring to declared cease-fires between the Afghan government and the Taliban for Eid, Geo News reported. "We particularly support all Afghan-owned and Afghan-led efforts aimed at bringing peace and stability to Afghanistan," he said. Pakistani Army Chief of Staff Gen. Qamar Javed Bajwa met with Afghan President Ashraf Ghani in Kabul to discuss regional security and counter-terrorism co-operation. Ambassador Zalmay Khalilzad's recent visit to Pakistan was meant to push the Pakistani authorities to convince the Taliban to engage in direct talks the Afghan government. The visit was part of Zalmay Khalilzad's efforts for peace talks between the Afghan government and the Taliban.